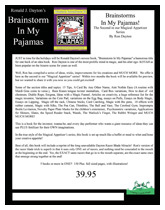 Ronald Dayton's newest book, "Brainstorm In My Pajamas" a humorous title for one heck of an idea book. Ron Dayton is one of the most prolific mind in magic, and his alter ego- KOTAH as been popular on the bizarre scene for years as well. Well, Ron has compiled a series of ideas, tricks, improvements for his creations and MUCH MORE. We offer it here as the second in our "Magical Appetizer" series! Within two months the book will be available for preview, but we wanted to share it with you now so you could get excited! Some of the section titles and topics: 15 Tips, A Card By Any Other Name, Aint Nothin Easy (A routine with Mardi Gras coins to verse. ), Bees Knees tongue twister mentalism, Card Box variations, How to dust of old chestnuts, Diablo Rope, Enigma, Ideas with a Magic Funnel, Articles on creativity, a huge reference list for the magic inventor, Variations on the Coin Pail, variations on the Egg Bag, essays on Pulls, Essays on Body Magic, Essays on Lapping, Magic off the rack, Chinese Sticks, Card Catching, Magic with Bic pens, 18 effects with rubber cement, Magic with Silks, The Pea Can, Thimbles, The Ball and Vase, The Cerebral Gym, Impromptu Bottle Levitation, Novelty Paper Plate Masks for the children's entertainer, Psychometric variations, Applications for Shiners, Slates, the Speed Reader Stack, Wands, The Warlock's Finger, The Rabbit Wringer and MUCH MUCH MORE! This is a book for the inventor, wanna-be, and every day performer who wants a giant resource of ideas they can use PLUS fertilizer for their OWN imaginations. 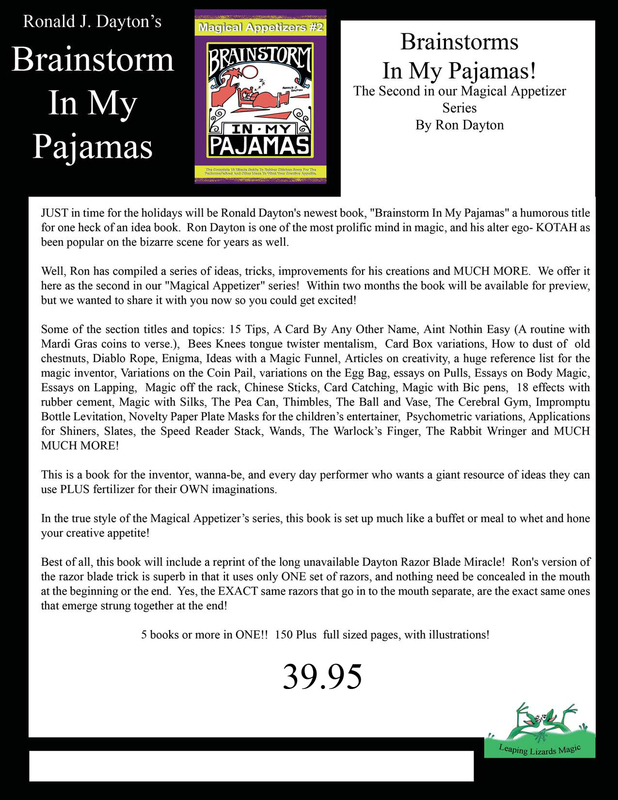 In the true style of the Magical Appetizer's series, this book is set up much like a buffet or meal to whet and hone your creative appetite! Best of all, this book will include a reprint of the long unavailable Dayton Razor Blade Miracle! Ron's version of the razor blade trick is superb in that it uses only ONE set of razors, and nothing need be concealed in the mouth at the beginning or the end. Yes, the EXACT same razors that go in to the mouth separate, are the exact same ones that emerge strung together at the end! Click on the following thumbnail image to get a full-size printable flyer for the !